The Scott Pilgrim series of graphic novels, written by Bryan Lee O’Malley, was a celebration of everything that makes geek culture so fantastic. Every book is bursting at the seams with nods to Mario, Metroid, Final Fantasy, X-Men, and many others. Alongside the references, each book serves up a nice cold glass of original jokes. 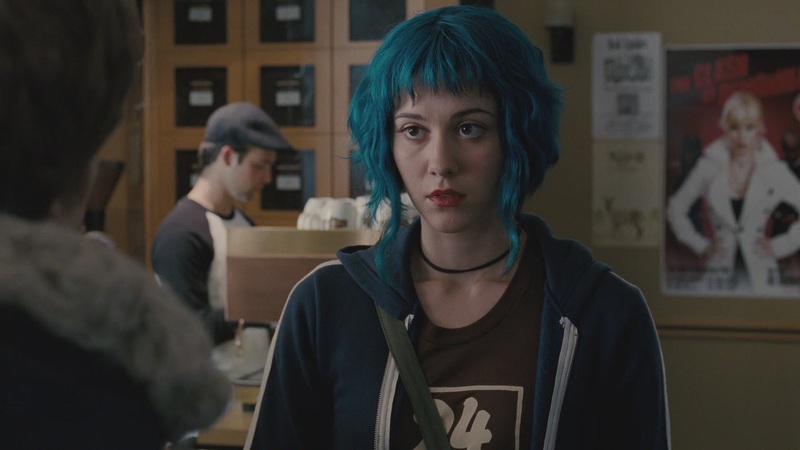 In the world of Scott Pilgrim, vegans have telekinetic powers, an Amazon.com delivery girl uses subspace highways to deliver packages, and a 17-year old girl gets punched so hard that it knocks the blue highlights out of her hair. But the references and humor were merely the garnish on O’Malley’s literary burrito. The meat, cheese, and refried beans of the Scott Pilgrim books were the entertaining story and well-developed characters. Scott Pilgrim is a 23-year old deadbeat, crappy bass player living in Toronto, Canada. Following a rough breakup, Scott’s living with a friend named Wallace, and dating a Chinese schoolgirl. But when he meets the incomparably awesome Ramona Flowers, Scott falls in love, and begins dating Ramona. Scott quickly learns that, to date Ramona, he must defeat her seven evil exes in a duel to the death. It’s a quirky story setup, and it serves as a vehicle for action, romance, and strong character development as Scott learns more about himself through his battles for Ramona. Eons ago in 2010, Scott Pilgrim vs. the World burst onto the scene, starring Michael Cera as Scott Pilgrim and Mary Elizabeth Winstead as Ramona Flowers. In a single film, Scott Pilgrim vs. the World aimed to condense the story of the six graphic novels into a single film, and fortunately, managed to succeed overall. Despite some hefty changes from the material in the books, the film is tons of fun, with excellent writing, stylish special effects, and hefty helpings of humor. For the most part, the elevator pitch for the Scott Pilgrim books and Scott Pilgrim vs. the World are identical. Scott Pilgrim has to defeat Ramona’s former squeezes, all the while growing into something more than a Canadian bass-playing deadbeat. But delving deeper reveals changes made to the circumstances in which Scott fights his foes, as well as the removal of the many “flashback” sequences in the books. I’d be straying dangerously close to spoiler territory if I gave any more details, but believe me when I say that it was a good call. It’s all for the sake of pacing, and it’s a worthy sacrifice. The film doesn’t build on the characters as well as the books, but by the time the credits roll, Scott’s character arc has satisfyingly run his course, and he’s no longer the loser he once was. The special effects in Scott Pilgrim vs. the World are beautifully colorful and stylish. Sometimes, onomatopoetic words like “pow” appear in the movie, as though the characters are inside a comic book. At times, the effects also make Scott Pilgrim vs the World look like a videogame come to life. When Scott battles Matthew Patel (Satya Bhabha), the first of Ramona’s evil exes, a health bar and the word “FIGHT!” appear near Scott, and as he fires off a volley of vicious punches, a combo counter tracks every single hit. Scott Pilgrim vs the World featured many humorous bits from the books, but also brought its own jokes and references to the table. Early on in the movie, there’s a scene in which the treasure chest jingle from “The Legend of Zelda” plays when Scott opens a door to let his girlfriend in to sit in during band practice. In a different scene, after a cut to Wallace and Scott’s apartment, the bass riff from Seinfeld plays, and everything Scott says in the scene garners a response from a studio audience. But sadly, things aren’t all peaches and cream with Scott Pilgrim vs. the World. 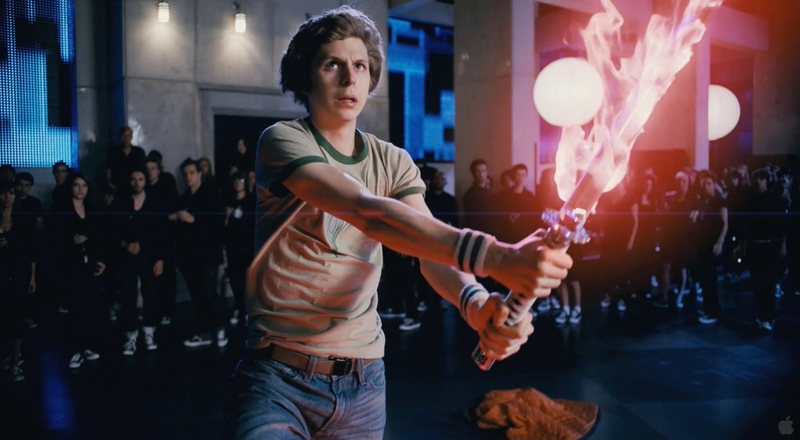 If you’ve seen Juno or Superbad, and didn’t like Michael Cera in either of those movies, you won’t like him in Scott Pilgrim vs. the World either. He plays the same shy and nerdy character that he always plays. While the special effects are stylish, the menagerie of flashing lights and colors could easily induce a real humdinger of a headache in folks who can’t handle those kinds of crazy visuals. However, the greatest weakness of Scott Pilgrim vs. the World is that, compared to the books, the film’s character development is far weaker. The books contained plenty of flashback scenes, divulging info on Scott’s past romances. On top of that, the books had far more interaction between Scott and the various characters. Consequently, many of the characters in the books had fleshed out character arcs with satisfying conclusions. The film shifts the focus to action, and while Scott grows as a character, many of the other characters seem flat, reduced to only one or two identifiable traits. Scott’s ex Kim Pines (Alison Pill), for instance, is an angry person with a grudge against Scott, and it doesn’t go much deeper than that. When all’s said and done, Scott Pilgrim vs the World is an enjoyable film with some niggling issues. Its special effects are stylish, but potentially brain-melting. The acting is good, unless you don’t like Michael Cera. Scott’s character is pretty well-developed, but no one else enjoys the luxury of being more than two-dimensional. If you want the full Scott Pilgrim experience, the books are the way to go. They’re fantastically fun, and immensely well-written. But for people who think Scott Pilgrim vs. the World sounds interesting, and don’t want to invest the time and money it’d take to buy and read six books, the movie is easy to recommend. It’s far from perfect, but Scott Pilgrim vs. the World has a lot of heart, and it’s a smile-inducing movie, faults and all. *images from fanpop.com and tcdailyplanet.net. Video from Universal Pictures.